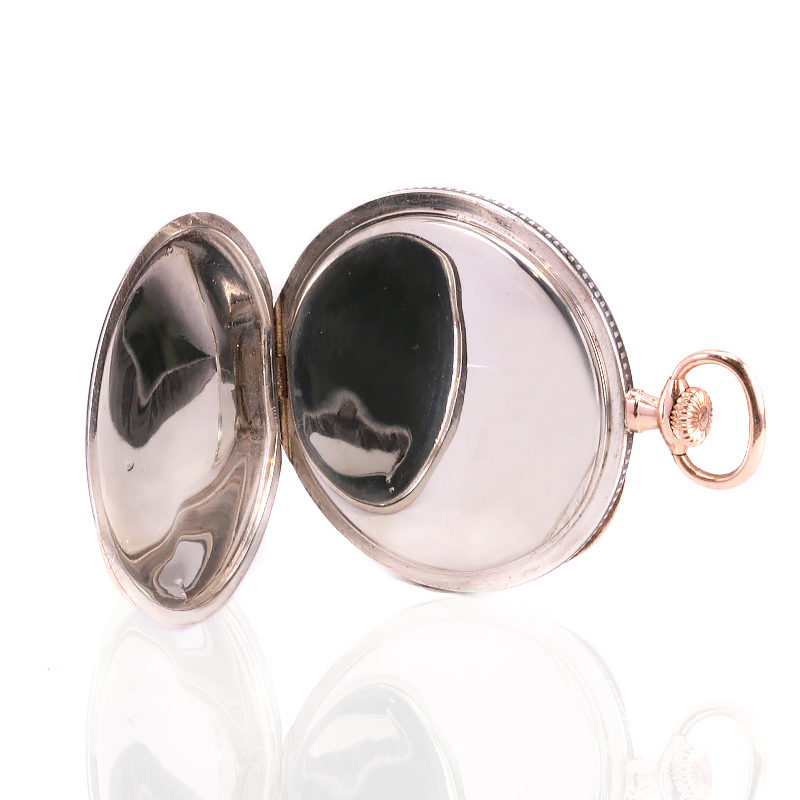 Product code: ES7930 Category: Sold Pocket watches. Here is a magnificent piece of history – an original Art Deco Niello Tiffany & Co pocket watch with original box that looks amazing no matter which side of the pocket watch is viewed. 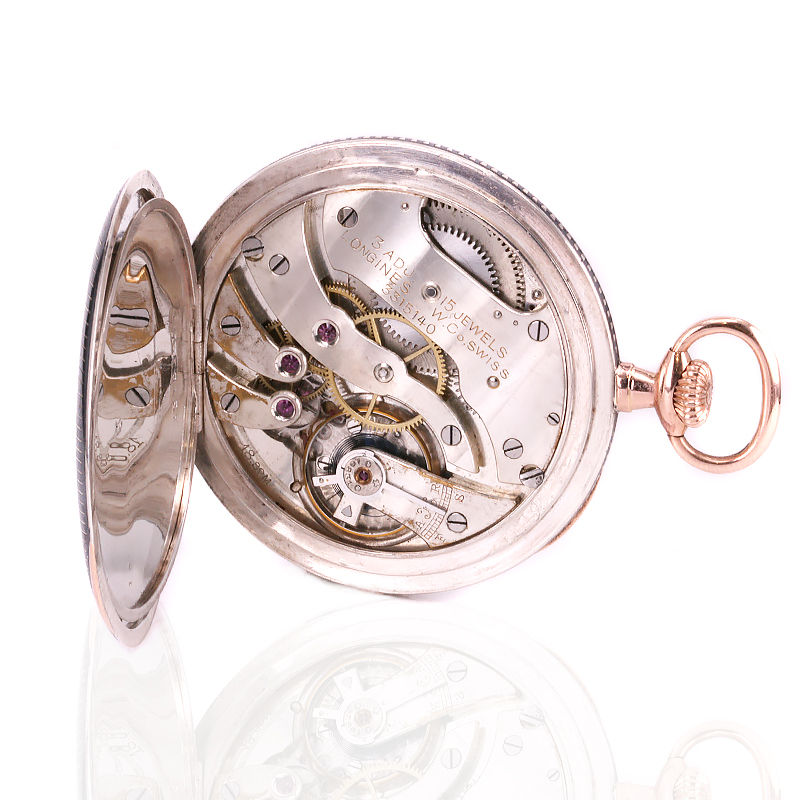 Made in 1918, the case is made in 14ct and silver and highlighted with niello. Niello is actually not an enamelling technique, rather it is a blackening technique produced as an alloy of sulfur with copper, silver and lead. Once produced it is then used to fill the channels that have been previously engraved into the metal, and after a few more steps including polishing, the result is a wonderful contrast of colours in often a beautiful design. In this pocket watch, there is the most stylish angular design that not only looks amazing, but also feels wonderful to hold in the palm of your hand. Measuring 45.9mm across by 61.2mm to the top of the bow, it also measures a very slim 9.5mm in width which is also a testament to the lovely quality movement inside that was made all those years ago. Made by Longines in 1918, there is also the archive papers from Longines stating that this was made for Tiffany & Co. The movement runs beautifully and comes with our twelve month warranty. The dial is all original and displays elegant Roman numerals and sub-seconds and is signed Tiffany & Co. With its lovely hands to match the style of the time, this is one pocket watch that is sure to always get the admiration that it deserves. Complete with its original Tiffany & Co box, this is a real treasure to hold and admire. Art Deco Niello Tiffany & Co pocket watch with original box by Longines. Dating from around the 11th century, niello is blackening technique produced as an alloy of sulfur with copper, silver and lead. Once produced, it is used to fill designs that have been engraved into the surface of a metal. Usually done to silver, once applied to the metal and heated, the result is a black colouring that runs into the engraved channels. The excess niello is then removed by scraping until the filled channels are clearly visible, and finally the surface is polished. The contrast of the black niello against the bright silver surface produces an attractive decorative effect. Regaining popularity during the Art Deco period of the 1920’s to the 1940’s, niello jewellery has a look that although first appearances will lead people to think it is enamel, it does have its own unique texture and feel.